This post is one of a series on projects supported by the Aquarium’s Marine Conservation Action Fund (MCAF). Through MCAF, the Aquarium supports researchers, conservationists and grassroots organizations all around the world as they work to address the most challenging problems facing the ocean. 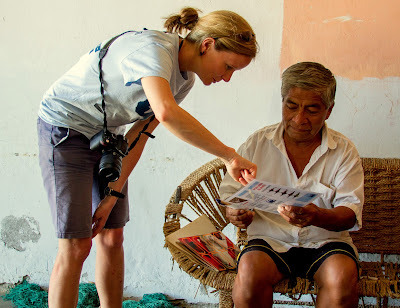 In the blog post below, MCAF grantee, Ruth Leeney, PhD, founder and director of Protect Africa’s Sawfishes describes working with the Peruvian NGO, Planeta Oceano on groundbreaking studies of sawfish in Peru and Ecuador; a collaboration that was facilitated by MCAF. Central or South America, but a number of projects have recently developed which promise to change all that. A largetooth sawfish (c. 5.6 m total length) captured off northern Peru in February 2015. Africa’s Sawfishes, and a new collaborative project was born. 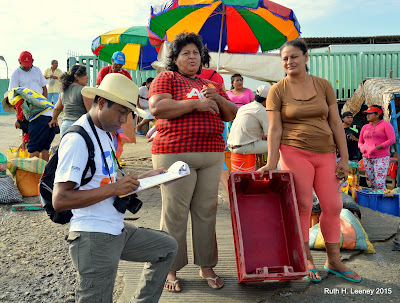 undergraduate students, fisheries officers, and even a professor from Tumbes University, where the course was held. in northern Peru, including one 5.6-metre long adult caught and released alive in February 2015 (see photo above), so we were eager to learn more about that capture and why the fishermen had been motivated to release the sawfish. I was delighted to meet the fisherman who owned the boat from which that catch had been made, and whose sons were amongst the crew that day. He explained that one of the crew members knew that sawfish are rare and had contacted a local NGO for advice on what action to take. The crew brought the sawfish back to the port, got assistance from local fisheries officers with untangling it from their net, and released it. This is a wonderful example of the positive impact that numerous Peruvian NGOs are having on the attitudes of small-scale fishers towards marine conservation issues. A fun feedback session with the course participants. of mangrove forest and creeks, winding out towards the coast and the border with Ecuador. 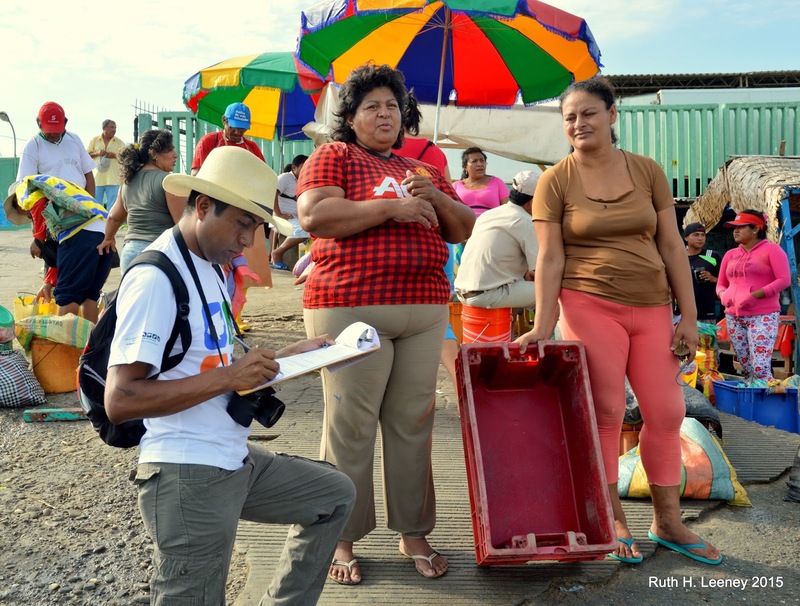 Dr. Rigoberto Rosas-Luis from Ecuador, interviewing fish vendors in northern Peru. sawfish (in 2014) in San Lorenzo, northern Ecuador. A fisherman being interviewed by course participants Cristhian and Andre at Zorritos beach. need to take to protect them. "The visits to landings sites and ports in the Tumbes area (northern Peru) were great. …..the course has provided me with new skills and the knowledge to create new research projects in Ecuadorian waters." Ruth Leeney was supported by the Swiss Shark Foundation. Planeta Océano's sawfish research is funded by the Mohammed Bin Zayed Species Conservation Fund. Many thanks to Elizabeth Stephenson of the New England Aquarium's Marine Conservation Action Fund, for linking Planeta Océano with Protect Africa's Sawfishes and encouraging collaboration to advance sawfish research and conservation!